At Gotham Greens, we are always looking to improve our business and, therefore, welcome your feedback. Your comments help us to serve you better. Have comments or feedback on our products? Interested in urban greenhouse development? Want to provide your customers with Gotham Greens produce? Please feel free to contact us by emailing info@gothamgreens.com. Head of Strategic FinanceGotham Greens is seeking an experienced and passionate head of strategic finance to work closely with our leadership team to help with the planning, management, and execution of a variety of core initiatives. The position will be expected to work on a multitude of projects that can range from new market incubation and growth strategies; to participating in the analysis and execution of equity, debt, and M&A opportunities; to pricing and sales strategies. Database Administrator and Inventory Specialist Gotham Greens is seeking an exceptional database administrator and inventory specialist to manage and maintain its data infrastructure across multiple systems and databases within an Azure web-hosted environment. This role is responsible for maintaining the integrity of company data and ensuring that data warehousing, systems, servers, and connections perform as required. In addition, this role will be responsible for product inventory management. Director of MarketingGotham Greens has an immediate opening for a director of marketing to lead, develop, and inspire a high-performance marketing team. The individual will spearhead the formulation and implementation of marketing strategy, focusing on building out the product marketing portfolio and elevating our brand nationally. Assistant Plant Manager, ChicagoThe Assistant Plant Manager reports directly to the Plant Manager and works closely alongside the Senior Grower, Production Supervisors and Director of Operations. The Assistant Plant Manager is directly responsible for the overall guidance and management of the day to day operations in the Greenhouse facility including but not limited to, seeding, transplanting, harvesting, packing and processing leafy greens and herbs, distribution and logistics of finished goods and overall management of plant operations. Plant Manager, ProvidenceGotham Greens is seeking passionate, driven, and hardworking individual to fill a position as a Plant Manager for our Providence, R.I. location. This is a hands-on visible position requiring direct oversight of labor management, production process, packaging, and distribution. Assistant Grower, ChicagoGotham Greens is seeking an Assistant Grower to join our Chicago region. This role will work closely with and report to the Head Grower to manage all aspects of crop production for the Chicago region. More specifically, this role is focused on production scheduling, plant nutrition, inventory management and food safety. Product Manager, NYCGotham Greens has an immediate opening for an exceptional individual to manage the company’s diverse product lines across packaged salads, herbs, dips, and dressings. The individual will lead the expansion of new product development across all categories and manage all aspects of the value added product categories, such as the company’s dips and salad dressing lines. Sales Administrator, NYCGotham Greens is seeking a dynamic sales administrator with 2-5 years of relevant experience to support our national Sales team. The sales administrator communicates frequently with customers via phone and email to ensure we are executing orders effectively and customers are satisfied with our products and level of service. The individual also provides administrative support to the Sales team and collaborates with members of the Sales, Marketing, and Operations teams to fine tune sales operations. 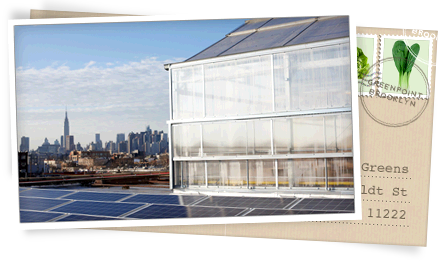 Greenhouse Facilities and Maintenance Mechanic, NYCThe Facilities and Maintenance Mechanic will be responsible for the overall inspection, maintenance, repairs, upgrades, and improvements of our 3 greenhouse facilities located in New York City (Gowanus, Brooklyn; Greenpoint, Brooklyn and Jamaica, Queens). Under the direct supervision of the Operations team, this position will be responsible for ensuring optimal performance of all facilities. Experience in the Greenhouse/Hydroponic industry is preferred but not required. This is an opportunity for an enthusiastic, self-motivated and highly organized leader to join a rapidly growing, innovative, disruptive company in the 21st century food system. RecruiterGotham Greens is seeking a dynamic recruiter to join the National HR team. In this role, you will work closely with the hiring managers to strategize and execute on impactful recruiting strategy. The recruiter will be responsible for sourcing top talent, guiding candidates through the hiring process from application to offer- ensuring an impeccable candidate experience along the way. In addition, this role will partner with the Head of HR to holistic view of the company’s growth and talent landscape to build a lasting impact on the success of Gotham Greens. Manager of Technology and Business Intelligence The Manager of Technology and Business Intelligence will be responsible for owning the design, development and implementation of advanced technological solutions to solve business challenges. The successful candidate will be a seasoned tech veteran with project management experience in working with managed service providers and OEMS, hiring, managing and/or outsourcing developers or engineers, experience in managing and manipulating large data sets for use, business intelligence, machine learning and artificial intelligence. The successful candidate will be able to envision and implement data science technologies, frameworks and analysis that will influence strategic decisions throughout the Gotham Greens organization. The manager will be tasked to implement all the necessary information technology infrastructure, security, and business intelligence platforms, as well as helping create the hiring plan to buildout the technology team to help support the growth of Gotham Greens. Head Grower, ChicagoGotham Greens is seeking an experienced and passionate Head Grower to lead our Chicago region. This role will manage all aspects of crop production for the Chicago region to achieve and surpass company yield and quality expectations. The Head Grower will report to the Chief Greenhouse Officer, oversee several direct reports and work closely with the Chicago Regional Plant Manager to run a smooth and efficient operation. Marketing + Sales Coordinator, ChicagoGotham Greens has an immediate opening for an exceptional individual to work directly with the Gotham Greens Marketing team. This role reports to the Director of Marketing. This role will: contribute to growth of the brand through new customer acquisition and retention and will help develop experiential marketing programs that articulate, influence and further develop the Gotham Greens brand. Product Demonstrator Gotham Greens has an immediate opening for an exceptional Product Demonstrator in the Greater NY and Greater Chicago area. The position will prepare light recipes using Gotham Greens' leafy greens, herbs and fresh food products. The Product Demonstrator will also introduce Gotham Greens premium quality products to customers, provide product education, promote sales and serve as brand ambassador. This role is also essential in gathering customer feedback for internal intelligence and analytical utilization. HR Associate, NYCGotham Greens is seeking a dynamic HR Associate to join the National HR team. As a consultant and implementer, the HR Associate will be accountable for the execution of HR strategy and all the people-related decisions and processes. The HR Associate will handle all facets of HR for all three NYC greenhouses including: employee lifecycle, employee relations, recruiting, performance management, training, morale and compensating/benefits. In addition, the HR associate will be an integral member of the site leadership team and partner with managers in HR matters. Working closely with the Head of HR, this position will bridge the gap between strategic and tactical HR functions, initiatives, and processes. The successful candidate will be exceptional at handling multiple priorities, communications at all levels, handling confidential and sensitive materials, and influencing various levels of stakeholders. Assistant Project Manager - ConstructionGotham Greens is seeking an exceptional assistant project manager to assist with new greenhouse facility development across the United States. This position will be key to the company’s timely execution and budget maintenance throughout the project stages through effective preparation, coordination and management of project tasks. The assistant project manager will be responsible for facilitating the day-to-day coordination, documentation, and reporting for the construction development team. The ideal candidate will have several years of experience working with construction projects, an impeccable attention to detail and superior skills in managing multiple priorities and stakeholders. Director of Development and ConstructionGotham Greens is seeking an experienced and passionate Director of Development and Construction to manage the development of new greenhouse facilities across the United States. This individual will identify and evaluate current and future real estate needs, source prospective locations, and lead project development from site selection to completion. This individual will direct the site selection, due diligence and entitlement processes; lead project development; assist in project design and planning; assist in project financing and financial analyses and oversee construction management and administration. Construction and Development CoordinatorGotham Greens is seeking an exceptional Construction and Development Coordinator to assist with new greenhouse facility development across the United States. This position will be key to the company’s timely execution and budget maintenance throughout the project stages through effective preparation, coordination and management of project tasks. The Coordinator will be responsible for facilitating the day-to-day coordination, documentation, and reporting for the construction development team. The ideal candidate will have several years of experience working with construction projects, an impeccable attention to detail and superior skills in managing multiple priorities and stakeholders. Production Lead, ChicagoThe Pack House (PH) Lead will be responsible for day-to-day supervision of the Pack House production and inventory management. The PH Lead reports directly to the Pack House Supervisor and works in collaboration with our Sales, Customer Service, Logistics and Distribution team. Local GrowerGotham Greens has an immediate opening for an exceptional individual to be a Local Grower. This position will be an integral part of our company chiefly responsible for the growing and crop management at their specific greenhouse. Greenhouse Assistant: NYC + ChicagoSeeking Greenhouse Assistant for Brooklyn, Queens and Chicago locations. This is an entry level, hands on position working with the plants from seed to harvest.